Import, export & update products all fields via spreadsheet. Edit thousands of products with one click! All this with one click for thousands of products! To update product with a CSV file you should include valid product ID in the first column. If the first column doesn’t have ID or the ID is invalid a new product will be added. The product ID’s are available in the first column when exporting. You can also update products by SKU. If you are exporting products from other software with external identifier you can also use it to update products in the catalog. If you want to attach some external images to your products your can easily do it with Product CSV. Provide any image URL (don’t need to be uploaded to your media library) in product image field and the software will import the images and attach them to products for you. With Product CSV extension you can import product categories and subcategories and add a description to them directly from a CSV file. You can even attach an image to the category from a CSV file. With Product CSV you can export products by category or attributes. Select unlimited number of product categories and attributes to filter the output for export file. 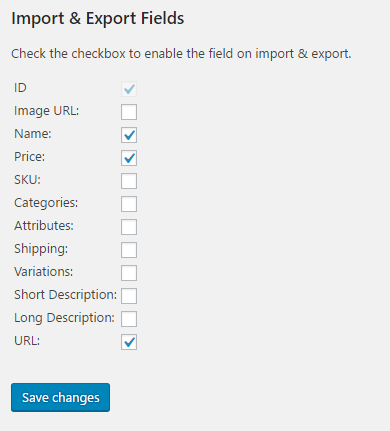 You can select which fields should be imported/exported. Thanks to this feature you can e.g. update only prices which is a lot faster that updating all the product data. Export or Import the products.